Sometimes I feel like a bad mom. I’m going to tell you a secret I’m a little ashamed of; I haven’t taken “professional” family photos in over two years. gasp. I know, I’m a bad mom. I’ve always been amazed at the moms who have professional photo shoots every few months with their kids in the perfect outfits and their hair perfectly brushed. Meanwhile, I’m over here struggling to get my kids to school on time. #imahotmess. But, every now and then I surprise myself. 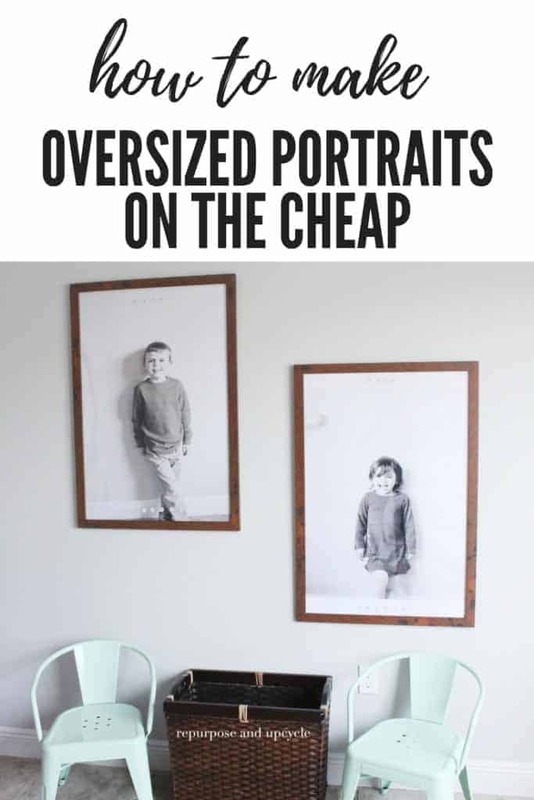 Like this ingenious idea I had to make my own oversized pictures of portraits of the kids on the CHEAP with DIY engineered prints. Let me first say something; I did use a high dollar camera although that is not necessary. Smart phones have the ability to take fantastic pictures, so don’t think that you can’t re-create these oversize portraits without one. My desire to create these engineered portraits evolved out of a desire to document my kids in the natural. Just my kids, as they are, with their personalities shining through. With that being said, you will understand why they aren’t dressed their best and their hair isn’t perfectly brush (Lord knows my daughter won’t let me touch her hair anyway). This post contains affiliate links. This means if you purchase from one of them I will receive a small commission, but rest assured that you will pay no more for the product. 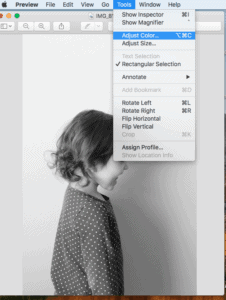 Let’s get down to the details on how to create these extra large oversized family portraits, shall we? I found a great deal on oversized picture frames from Michaels. 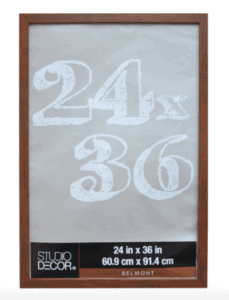 For $19.99 you can get a 24″ by 36″ picture frame. This, in my opinion, was super cheap for a frame that size! After I ordered the frames, it was time for the “photo” session. I don’t know about you, but any time I try to take pics with my kids it is a disaster. Like I said earlier, I did use a nice camera, but your camera phone should work just as well since we aren’t going to be printing these with a high end printer or using high end paper. An engineered print is actually that; a print of an engineered drawing. Since engineered prints are cheap (like $3.50 for a 24 by 36) and meant for engineered drawings not photos, it’s much better to print them out in black and white. Because DIY engineered prints are not made for photo quality, you need to edit your oversized pictures or portraits a few ways. After you’ve transferred the images to your computer, go to tools and adjust the color. Another note, you don’t need a fancy program to do this. You can edit the photo file, or if you prefer to use an editing program, there are free ones. I use Polarr Photo Editor Light and I love it (it’s free!). I’m on a Mac, so if you use a PC this might look a little different, although I wouldn’t think too much. 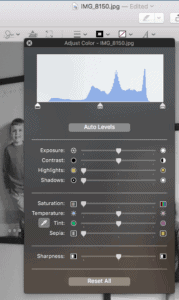 When you see the color box, adjust the saturation all the way until the picture looks black and white. Next adjust the size. 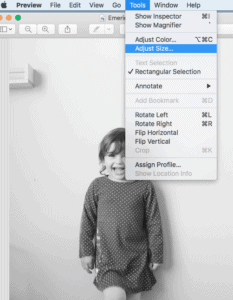 If you don’t do this, your large family print will be super grainy. I adjusted my photos to 200, and that seems to work well with the engineered print. Another big thing I screwed up on……..
Make sure you adjust the size of the photo to 24 by 36. I adjusted the width to 24 and kept the photo to scale which made the length longer than 36.” I assumed this would be ok and the extra just wouldn’t print. To my dismay, the lady at Office Depot said it wouldn’t print the right size if the length was over 36″? Maybe it was just the sales lady I spoke to, but don’t make the same mistake I did. 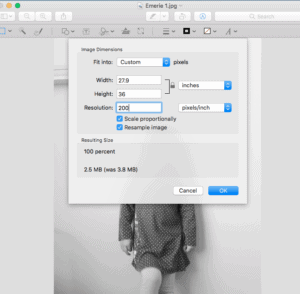 Adjust the size correctly BEFORE you take the file to a printing store. Another note; I’ve seen many other bloggers create their oversized photos with engineered prints for about 3 dollars. The lady at Office Depot did confirm that a 24″ by 36″ engineered print was $3.50. BUT she highly suggested using a higher grade of paper (because a photo uses more ink and might tear the cheap engineered print paper) and this raised to price to $19 per print. So that is what I chose. My total with the frames for two engineered prints was about $60. I’m still pleased with that! The last thing I did was add letter stickers with my kids name’s and age. That’s it as far as creating an affordable extra large framed portrait of my kids! I hope you enjoyed this post and found it useful. I would love for you to save the image below to Pinterest! Do y’all want to see some more budget friendly crafts and home projects? I bet if you enjoyed this post you might want to see my kids toy storage table I created in less than a day. Wow, I LOOOVE those photos. I actually prefer this to those pretentious “professional” shots that are all “look at our perfect family in our designer jeans and matching white shirts and perfect hair” carp. What you’ve done is to show the true beauty of your children! We need more of this in all of our lives, and less of the fake perfection. Thanks for the inspiration. Great idea! Don’t sweat it; I do “pro” pix of my kids once a year…from a place like JC Penney, LOL. 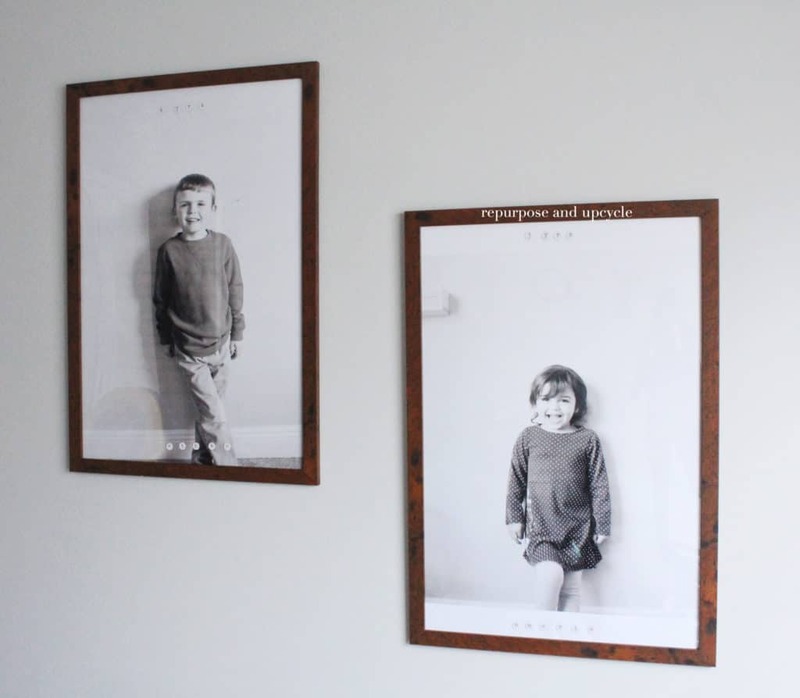 I have a giant frame with no idea what to do with it so getting a fun black & white photo of the kids printed up may just be the ticket to home decor happiness. Visiting from Nifty Thrifty Sunday. May I just say….GENIUS!!!!!!! What a clever idea, and I am thinking of ways to use this method for other photos, not just my handsome son. Thank you for posting this. I’m so glad you like this post! I wish I had done this earlier. Thanks for stopping by Evelyn. I’m so glad this little project is an inspiration! Thanks for stopping by Susan. This is so inexpensive that I won’t feel bad getting this done a couple of times a year. Thank you! Great! glad I could help. Thanks for stopping by. LOL, that makes me feel better. I prefer to take my own photos anyway too! I love this so much! I like how they aren’t “professional” photos. It is so much more personable when your kids look the same as they always do! Great idea!! Pinning! Your portraits look amazing. These would make lovely gifts for Grandparents and other family members as well. Thank you for sharing this creative, frugal project with us at the Hearth and Soul Link Party, Lindsey. Such a beautiful idea! I’ve shared the link to your post on my Facebook page. So awesome! This is a great idea, thank you for the tips. Other than the occasional professional photos we’ve taken as a family in the past, the largest photos we have at home are those I can run through our home printer, so they’re never oversized. I’m so glad you liked this post! If you give them a try let me know how it goes! Oh great, thank you so much for stopping by! Have a great day. Love the look! 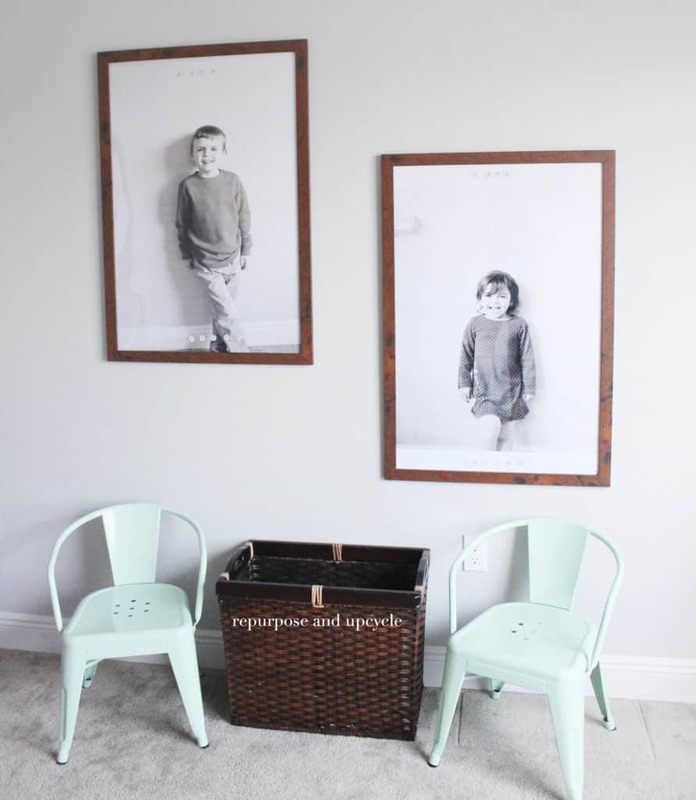 I have five kids and a long empty wall in my living room…thanks for sharing! These came out beautiful. I’ve printed on engineer paper before for chalkboard printables…never photos. Thanks for the tip to upgrade the paper. Worth it for these beauties. We’ve only had one set of professional photos done and that’s because we won them and ended up buying more (fell right into that one). Will definitely give this a go! 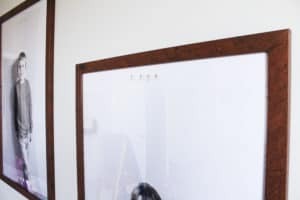 I just hopped by from Homestead Blog Hop to check out your oversized picture solutions and I shared this wonderful post. These are such useful and inspiring ideas. Naaaaa, you’re not a bad mom Lindsey, you’re just darn awesome. Love the huge portraits of the kids, they make such a WOW statement and it’s so refreshing seeing kids being natural, the way they are everyday when they’re being real. Beautiful photos! 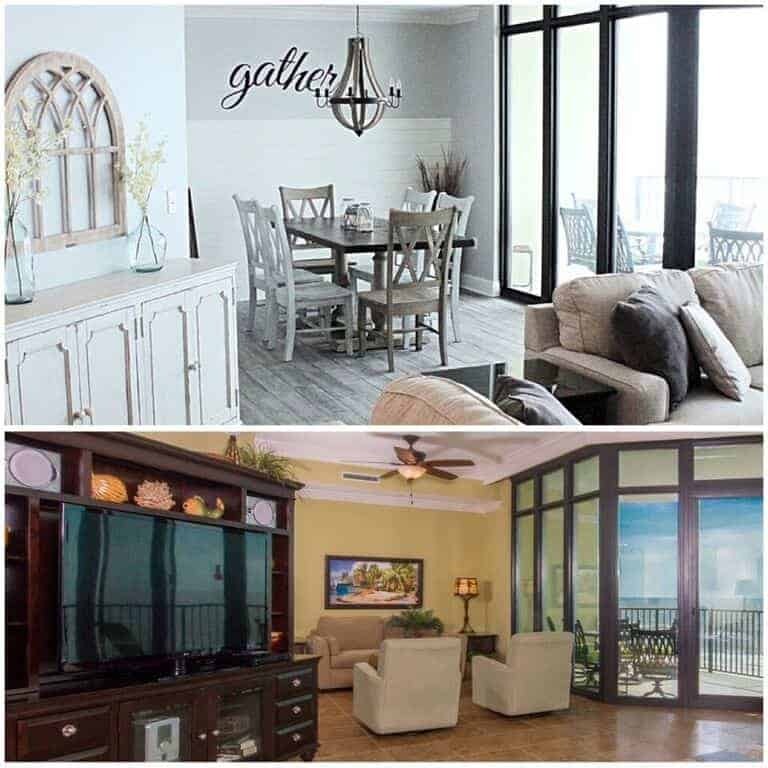 Pinned for inspiration — need to fill that blank spot on the dining room wall! Fantastic idea I’m definitely pinning this one! What a brilliant idea, they look fantastic and I think that is a really reasonable price! I much prefer candid photos of the kids. Thanks for linking up to the #bigpinklink this week. A great Idea Lindsey, I never would have thought of using an engineering print option for this! Thanks for sharing! Love these! What a great option for pics of your kids. You know, I never did the professional photos of my kids much–when they were little, we just didn’t have the money for it. And honestly I tend to prefer candid shots like these. I like these so much better than “posed” pictures and they look fantastic! Thanks for sharing this with us at the Homestead Blog Hop!